TORONTO (November 19, 2013) – Adrian Aucoin, a respected defenceman known for his leadership and consistency throughout his career, announced his retirement from the National Hockey League (NHL) today after 17 NHL seasons. In a professional career that spanned two full decades, Aucoin, 40, appeared in a total of 1,108 NHL games, amassing 121 goals, 278 assists and 399 points. The native of Ottawa, Ontario played for seven different NHL clubs over the course of his career. His career began with the Vancouver Canucks in 1995, followed by the Tampa Bay Lightning, New York Islanders, Chicago Blackhawks, Calgary Flames, Phoenix Coyotes and finished with the Columbus Blue Jackets last season. Notably, Aucoin scored his first career NHL goal on his first shot in his first regular season game on May 3, 1995, he scored his first career playoff goal in 1995 on his first shot in his first playoff game, and he also scored his first goal on his first shot in his first and only All-Star Game appearance in 2004. Aucoin was drafted in the fifth round, 117th overall, in the 1992 NHL Entry Draft by the Vancouver Canucks. Before he worked his way into the NHL, he honed his skills at Boston University and with the Canadian National Team program, an experience that saw him represent Canada at the 1994 Lillehammer Olympics where he helped his country to a silver medal. After playing most of the 1994-95 season in the AHL with the Syracuse Crunch, Aucoin made his NHL debut on May 3, 1995 with the Canucks when he scored his first career NHL goal against the San Jose Sharks. Aucoin also played in four playoff games with the Canucks that spring. He played most of the following season with the Canucks, after starting with Syracuse, and recorded 18 points in 49 games while helping the club again reach the playoffs. It was with the Canucks during the 1998-99 season that Aucoin played in all 82 games and scored a career-high 23 goals, a franchise record for defencemen, including 18 on the power-play – which tied an NHL single-season record for defencemen, at the time. He was traded to the Lightning in February 2001 after spending most of the previous six years in Vancouver. In June of 2001 he was dealt to the Islanders where he went on to play three seasons, averaging 78 games played, 11 goals and over 37 points while helping the club reach the playoffs each season. In the 2003-04 season, he played in the NHL All-Star Game, scored a career-high 44 points, placed fifth in Norris Trophy voting and averaged 26:38 of ice-time. Following three seasons on Long Island, and a stint with Modo of the Swiss Elite League during the 2004-05 lockout, Aucoin signed with the Blackhawks in the summer of 2005. In Chicago, he was named the 32nd captain in franchise history. He played two seasons with the Blackhawks before he was traded to the Flames in June of 2007. Over his two seasons in Calgary, he averaged 78 games played, 10 goals, 34 points and helped the club reach the playoffs twice. 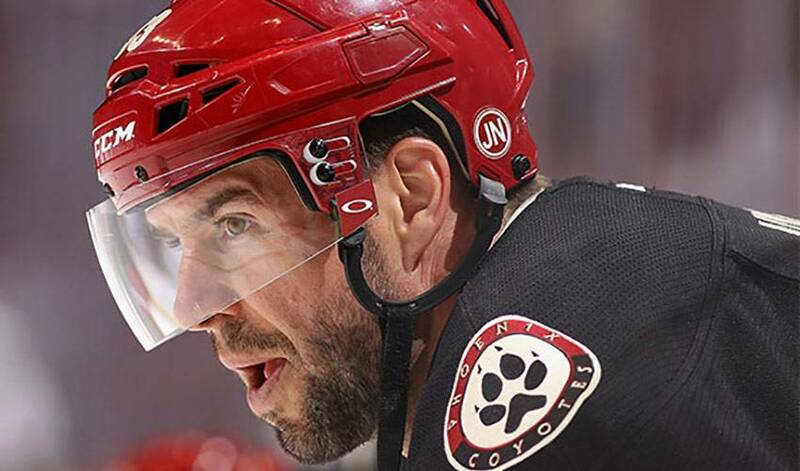 In July of 2009, Aucoin signed with the Coyotes where he averaged 73 games played and helped the club qualify for the playoffs in each of his three seasons, which included reaching the Western Conference Final in 2012. In 2012-13, his final NHL season, Aucoin played 36 games for the Blue Jackets and helped the team in its late season push that resulted in narrowly missing out on a playoff spot. Internationally, Aucoin represented Canada at the 1993 World Junior Championships where he helped his country win a gold medal, the 1994 Olympics where Canada finished with a silver medal and the 2000 World Championship. Aucoin, a 6’2”, 215 lbs. defenceman, was known to possess one of the hardest slap shots in the league during his career, a tool that helped him score 10 or more goals in six seasons, while he also played a strong and reliable defensive game – recording a career mark of +46 and averaging 23:12 in ice-time. He was a part of 10 playoff teams in his career, playing in 62 postseason games and recording 21 points. Throughout his career, Adrian has been actively involved in the NHLPA: he is a long-time member of the NHLPA Goals & Dreams advisory board; served as an NHLPA player representative while with the Islanders, Blackhawks and Coyotes; and was a member of the Negotiating Committee in 2012-13. He currently works in player development for the Blackhawks and resides outside of Chicago with his wife Caroline and their five children.